This is like no other Smart car you've seen before. The probably needs no introduction. Everyone knows it as a timid and unassuming little city runabout. This Smart ForTwo, however, is unlike any Smart car you’ve ever seen before. That’s because renowned tuning company Brabus has made some modifications. The result is called the Brabus Ultimate 125, and it’s a rather spectacular transformation – this is a Smart car that’s taken some strong steroids. Seen here as a cabriolet, a coupe version is also available. Boldly, Brabus has branded its creation as a “supercar.” Last we heard, 125 horsepower doesn’t qualify a car into supercar territory. Even still, it’s quite a jump from the standard ForTwo’s measly 0.9-liter engine. Combined with its 147 lb-ft of torque, the Brabus has enough oomph to get it from 0-62 mph in 9.2 seconds before it reaches an electronically limited top speed of 109 mph. As well as modifications under the hood, the ForTwo has had a substantial makeover, if you hadn’t already noticed from the images. Its wide body kit gives it a more aggressive appearance, with flared fenders at the front and rear axle to make room for some beefy 18-inch alloys. It also has a tire and wheel combination you don’t normally see in a car of this category. At the front are 205/35 R18 high-performance tires, while at the back you’ll find a pair of 235/30 R18 rubbers. They weigh only 6.7 and 7.1 kilograms respectively – these are some of the lightest 18-inch wheels on the market. We also never thought we would see a sport exhaust with three tailpipes fitted to a Smart car. 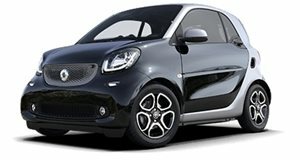 This really is the Ferrari of the ForTwo range. Inside, the Brabus Fortwo has been coated in Mastik leather, with a color theme that matches its brash blue paintwork, combined with contrasting black leather on other elements. Completing the sporty upgrade are stainless pedals, an aluminum shift knob, and door sills with “Brabus” lettering illuminated in red. As the model name implies, Brabus only intends to produce 125 models of this souped-up Smart ForTwo. The coupe will set you back around $52,660, while the drop-down will cost slightly more at $55,630. It will be shown for the first time at next week’s Geneva Motor Show, where it will debut alongside the .